F100-S fits most Samsung, Acer, Viewsonic, LG, Dell, HP, Asus, AOC flat panel LCD and LED displays. The product was enhanced with two built-in USB hubs for your convenience. 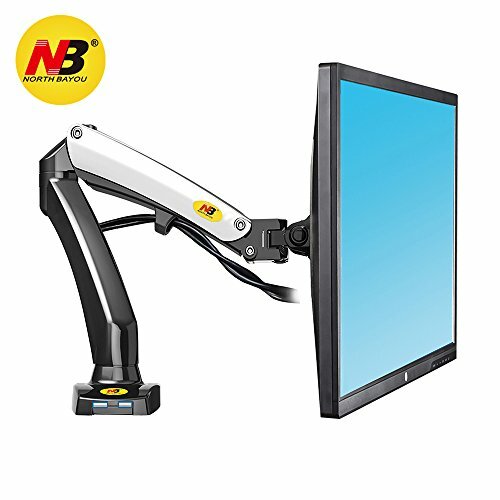 Thanks to the high-tech gas-strut arm your display can be installed on your work surface in the optimal ergonomic position which is important for creating a more productive and comfortable work environment. The rotating joints allow effortless fingertip monitor positioning. Durable steel and polished aluminum construction exceeds the expected service lifetime of the equivalents produced by other manufacturers and, moreover, we offer the product at the most reasonable price on the current market! If you have any questions about this product by NB North Bayou, contact us by completing and submitting the form below. If you are looking for a specif part number, please include it with your message.